The Daily Dot calls itself "the Internet's community newspaper," which basically means it's a website about how people are using the Web, and since one of the popular ways that people like to use it is to obsess over entertainment properties, it's got a lot of coverage of different kinds of fandom. Some of my favorites are the "bandoms" that have sprung up largely around boy bands and Japanese and Korean pop stars, and which occasionally inspire baroque sexual conspiracy theories. Right now Internet people are freaking out over a 12-piece Korean boy band called EXO, which is short for "exoplanet" and alludes to the fact that they're supposed to be from space or something. 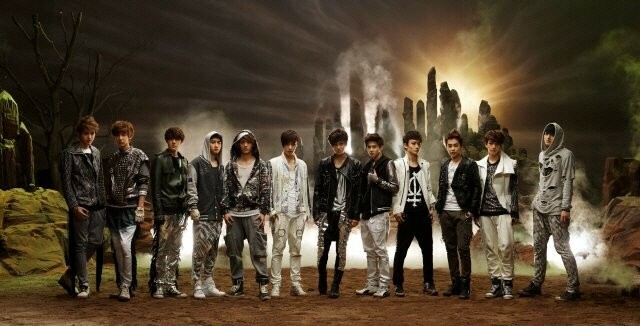 According to their lyrics and videos they're also wolves, magic phoenix-type creatures, and the Tree of Life. It's complicated, but the Daily Dot offers a thorough primer on the group. EXO's image and the massive popularity they managed to attain before releasing any music are insane, but still slightly less so than the music itself. The Daily Dot post contains a video for their new single called "Wolf." It's about being a wolf, naturally, and it sounds like someone quite literally made a song by stitching together something from every genre that teenagers are known to listen to. There's a rap part, a traditional boy-band part, a dubstep part, and even parts that hint strongly at metalcore and the EDM style known as "trap." It's not "good" per se, but it's deeply fascinating. And it's about being a wolf. Embrace the strange after the jump.